High-voltage tube overdrive pedal to give you anything from light break-up to super-smooth hi-gain saturation. Ibanez Tube King is a regal name in the distortion pedal kingdom. Once you hear this overdrive pedal, you immediately understand why. The TK999OD overdrive pedal features internal high voltage DC power”the best for making any solid-state amp sound just like a tube amp. The Ibanez overdrive pedal will give you anything from light breakup to super smooth hi-gain saturation. It is very versatile, with 3-band EQ that allows you plenty of play in shaping your tone. 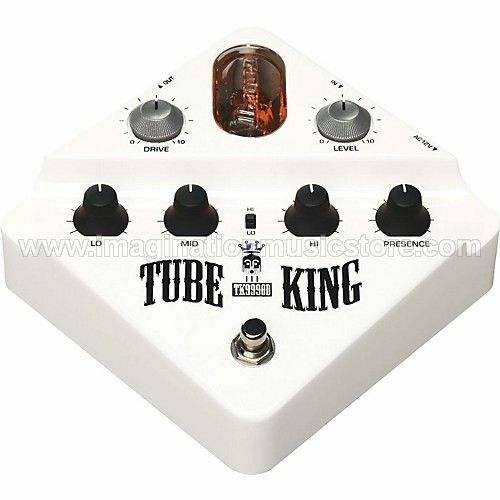 The Ibanez Tube King guitar pedal also includes a 12AX7 tube for true tube distortion.